Looe consists of two resorts, East and West Looe joined by an eight arched Victorian bridge across the River Looe. 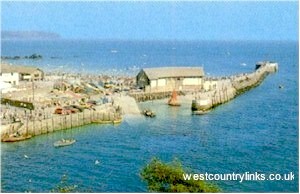 The towns of East and West Looe have been linked by a bridge since 1411 but were not united until 1883. West Looe is built around the church of St. Nicholas, erected some time before 1336. The tower has a campanile belfry, and in the early 19th century contained a "Scolds Cage" in which nagging women were placed. The Jolly Sailor Inn dates back to the 16th century. St. Marys Church in East Looe has a 13th century tower that used to be white washed . It is a land mark for sailors. The old Guildhall in East Looe was built in the late 16th century. Today it houses a museum which contains old punch bowls, documents, pillory, stocks and other items of local history. Looe island about half a mile off shore has the ruins of an medieval old monastery. Looe is famous for shark and deep sea fishing, and entertains thousands of holiday makers every year with it's wonderful beaches, and hospitality. Shingle and rocky shore with view of Looe Island. Parking possible on road, easy access. Cafes, toilets, activities, nearby. Sandy beaches with all facilities nearby. Car parking either at small quayside park or 15 minute walk from the main car park in West Looe. Easy access. All year dog ban on East Looe beach. Dogs allowed on Plaidy. A sheltered sand and shingle beach with rock pools. All facilities nearby, including boat hire and watersports. Car park, toilets, cafe and pub. Easy access. No dogs. Duloe, between the East and West Looe rivers and can be reached on foot from Looe along pretty woodland paths and lanes is, it has its own stone circle of six eight foot high granite stones. Lanreath is a small village close to Looe and just past Pelynt, Folk an d Farm Museum which has hundreds of vintage exhibits showing the history of farming. Morval another village on the way to Looe, it is set in a valley and indeed the word Morval means ‘sea valley’. There are two pubs and a 6th century church of St Wenna. Nearby is the ancient Morval House, once a Roundhead stronghold where Cromwellian troops were stationed. Close to Morval is Looe golf club, designed by Harry Bardon and high above sea level.